This 4-day instructor-led course gives you the comprehensive skills needed to work with the Information Design Tool. 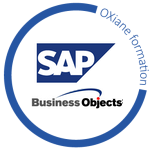 The Information Design Tool enables designers to extract, define, and manipulate meta data from relational and OLAP sources to create and deploy SAP BusinessObjects universes. In this course you learn how to use data from different source systems with the SAP BusinessObjects BI client tools. The Course is based on Software Release SAP BusinessObjects BI platform 4.0 BusinessObjects BI 4.0.